When I was straightening out the cupboards the other day I came across a box of Graham Wafer Crumbs which was purchased to make Cheesecake Stuffed Strawberries back in July; what to do with the remaining crumbs? Pour crumbs into 9X13 baking pan. Pour melted butter over crumbs, mix well then press evenly and firmly into pan. 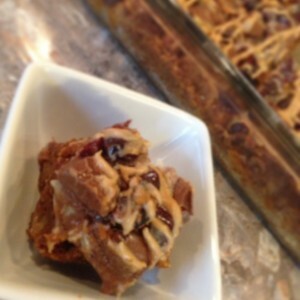 Layer coconut, nuts, chocolate chips and ‘mallows (if using), dried cranberries evenly over base. Drizzle condensed milk evenly over top. Remove from oven, drizzle with melted chocolate. Drizzle or pipe melted peanut butter. Allow to cool for a few minutes, cut into bars and cool completely. A beloved flavourful treat that has been carried off to school in many a lunch bags. These are sure to call forth many happy childhood memories! 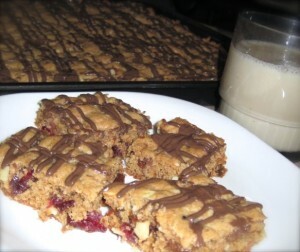 Mom might have made them in cookie-form but in these busy times it is quick and easy to make them as bars. In medium mixing bowl combine flour, baking powder, baking soda, salt, cinnamon, nutmeg and allspice; set aside. Add fruit and nuts, stirring well to evenly distribute. Spread evenly onto prepared jelly roll pan. Bake in 350F oven for 20 minutes or until edges are lightly golden and center is set. Cool slightly, then dust with a bit of powdered sugar. Remove bars from baking tray and cool completely on wire racks. Snickerdoodles, Snickerdoodles, Snickerdoodles! Go on, tell someone that you Love Snickerdoodles! They will probably giggle, say “What’s a snicker…. ?” or they will say “I know right! They are the best!” Either way, everyone should experience a Snickerdoodle at least once. 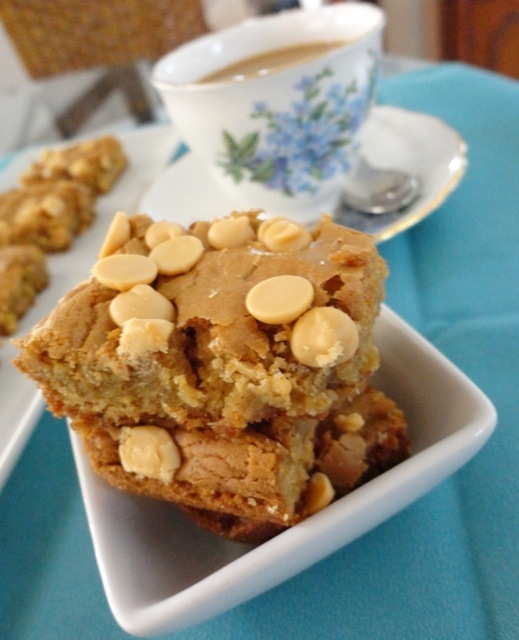 No worries, I have found the answer to your conundrum; Snickerdoodle Blondies! Just mix it up, pour into baking dish, done in the time it takes the oven to preheat! Lightly spray a 9X13 pan with vegetable oil spray. In small bowl combine 1 Tablespoon Sugar and 1 Tablespoon Cinnamon; set aside. In small mixing bowl, combine flour, baking powder and salt; set aside. In large mixing bowl cream together butter and sugar, brown sugar and vanilla for about 2 minutes. Add eggs, one at a time a time, stirring well after each addition. With mixer on low speed, stir in flour mixture until smooth, about 1 minute. Spoon half the batter in the prepared baking pan and spread evenly. Dollop small teaspoon size amounts of remaining batter evenly over cinnamon/sugar mixture. Bake in 350F oven for 20 – 25 minutes or until golden brown and toothpick inserted comes out clean. In small bowl combine icing sugar, vanilla and milk, to desired consistency, (start with about 1 Tablespoon of milk-easier to start with a little milk and add more if need than to add more powdering icing sugar!) and stir until no lumps remain. 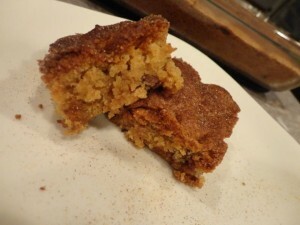 There are a gazillion Snickerdoodle recipes out there! I am a huge fan of the Betty Crocker Cookbook so I relied on Betty for my Snickerdoodle Brownies. The Grandsons are staying over for a couple of nights during a school week which means making lunches for them. The last time they were here on a school night I made Brownies and was quickly informed that “I don’t do Chocolate, Granny!” Ooops…so after dinner tonight, while the oven was still on I popped a pan of Butterscotch Brownies into the oven; the verdict is in, they are a huge hit! Lightly spray a 9X13 (4l) pan with vegetable oil spray. In medium saucepan, over medium heat, melt butter, stirring often. Add flour, baking powder and salt all at once and stir until well combined. Finally add chopped pecans, if using, mixing well. Pour into prepared pan and bake in 350F oven for 25 minutes. Remove from oven, cool, in the pan on a wire rack for a few minutes. 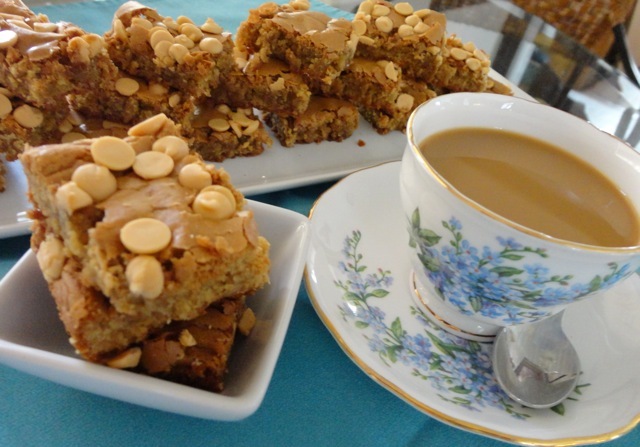 Sprinkle with Butterscotch chips, if desired, gently pushing them into the Blondies. After cooling for a few minutes, cut into desired amount of squares and allow to cool completely. When making up your weekly batch of Granola, have another bowl on hand to mix up the ingredients for these Granola Bars so you can have a healthy, nutritious snack at work, at school or at play! Prepare a 11x15x1 inch (28x38x2.5cm) baking tray by spraying lightly with vegetable oil spray. Combine first 12 ingredients together in a large bowl. In small mixing bowl, combine honey, eggs, vegetable oil, applesauce and vanilla. Stir liquid ingredients into dry ingredients until well blended. Bake in 350F oven for 12 minutes. 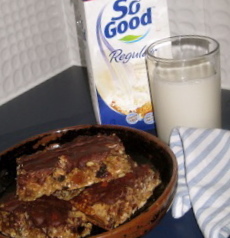 Remove from oven, sprinkle evenly with whole almonds, gently press the almonds into the granola bars. Return to oven and continue baking for 12 to 17 minutes. Score into bars and let cool for 30 minutes. Cut into bars and allow to cool completely. NOTE: Luke loves chocolate so when they are finished baking, I sprinkle with 200g Chocolate Chunks, return to turned off oven for 2 minutes, remove from oven and spread melted chocolate to cover the whole pan of granola bars. Looking for a yummy yogurt topping to replace the chocolate….